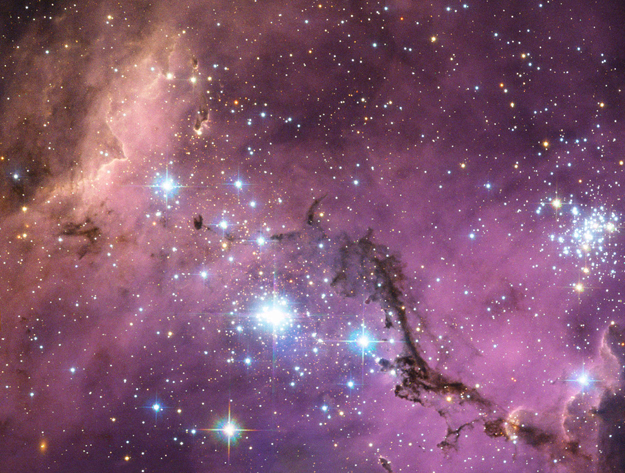 Nearly 200 000 light-years from Earth, the Large Magellanic Cloud, a satellite galaxy of the Milky Way, floats in space, in a long and slow dance around our galaxy. Vast clouds of gas within it slowly collapse to form new stars. In turn, these light up the gas clouds in a riot of colours, visible in this image from the NASA/ESA Hubble Space Telescope. The Large Magellanic Cloud (LMC) is ablaze with star-forming regions. From the Tarantula Nebula, the brightest stellar nursery in our cosmic neighbourhood, to LHA 120-N 11, part of which is featured in this Hubble image, the small and irregular galaxy is scattered with glowing nebulae, the most noticeable sign that new stars are being born. The LMC is in an ideal position for astronomers to study the phenomena surrounding star formation. It lies in a fortuitous location in the sky, far enough from the plane of the Milky Way that it is neither outshone by too many nearby stars, nor obscured by the dust in the Milky Way's centre. It is also close enough to study in detail (less than a tenth of the distance of the Andromeda Galaxy, the closest spiral galaxy), and lies almost face-on to us , giving us a bird's eye view. LHA 120-N 11 (known as N11 for short) is a particularly bright region of the LMC, consisting of several adjacent pockets of gas and star formation. NGC 1769 (in the centre of this image) and NGC 1763 (to the right, see heic1011) are among the brightest parts. In the centre of this image, a dark finger of dust blots out much of the light. While nebulae are mostly made of hydrogen, the simplest and most plentiful element in the Universe, dust clouds are home to heavier and more complex elements, which go on to form rocky planets like the Earth. Much finer than household dust (it is more like smoke), this interstellar dust consists of material expelled from previous generations of stars as they died. The data in this image were identified by Josh Lake, an astronomy teacher at Pomfret School in Connecticut, USA, in the Hubble's Hidden Treasures image processing competition. The competition invited members of the public to dig out unreleased scientific data from Hubble's vast archive, and to process them into stunning images. Josh Lake won first prize in the competition with an image contrasting the light from glowing hydrogen and nitrogen in N11. The image above combines the data he identified with additional exposures taken in blue, green and near infrared light. Although the Large Magellanic Cloud is generally classified as an irregular galaxy, it shares some features with spiral galaxies, including a clearly visible bar, and a single spiral-arm-like structure. It is thought that the LMC may be a small spiral galaxy that was pulled out of shape by the Milky Way.